Abhyasa Ashram is a 501(c)3 Nonprofit organization. Just behind Chili's, Timesaver Oil & Lube, and Badcock Furniture on Mary Esther Blvd, Fort Walton Beach, Florida. a visit to the ashram with a vacation to our beautiful beaches. ABHYASA ASHRAM IS a monastery and meditation center which practices universal meditation as taught by the ancient lineage of yogis of the cave monasteries of the Himalayas, especially as transmitted through Swami Rama. The tradition has no name, and is not affiliated with any of the institutions or religions of the plains of India or other countries surrounding the Himalayas, although individual meditators may personally align themselves with a wide variety of religions or institutions. WE MAY REFER TO THE TRADITION AS as "the tradition of the Himalayan masters" or "the Himalayan tradition", but that is for the sake of convenience, and is not a style or brand name as is popular these days. Our methods of meditation and contemplation involve systematic awareness of all levels of our being, including actions/senses, body, breath, mind, finally resting in the awareness of the Self (atman) which is one with the universal Self (brahman). At Abhyasa Ashram we have aspirant training, not teacher training. OUR APPROACH TO TRAINING is mostly individual coaching or mentoring, as Yoga meditation and contemplation has been traditionally taught for thousands of years. Aspirants with various degrees of experience naturally teach or share with others others within the context of their own lives and modes of service. EACH PERSON IS PURE CONSCIOUSNESS: From the perspective of our meditation tradition, each person is perfect, pure consciousness (atman, purusha, shakti) at the core of her or his being. The entire process of sadhana (meditation and contemplation practices) is to reduce the colorings that usually veil that realization (often called Self-realization). This is done by systematically receding inward through senses, body, breath, conscious and unconscious mind. MEANING of YOGA: At Abhyasa Ashram the word "Yoga" is used in its traditional meaning, rather than the revisionist meaning of Yoga as merely a gymnastic or physical fitness program. Yoga means “union” of the individual consciousness and universal consciousness, Atman and Brahman, Jivatman and Paramatman, as well as Shiva and Shakti (it's okay if you don't yet know the meaning of these words). It is pure consciousness (Purusha) standing alone from primal manifestation (Prakriti). Yoga is widely said to be over 5000 years old, while an even cursory review of modern Yoga "styles" reveals that most are less than a few decades old. Our practices are from the meditation tradition of the Himalayan masters, as passed down from the cave monasteries of the Himalayas through Swami Rama (and the lineage of Bengali Baba and Mahavatar Babaji), not the institutions in the plains of India. To write or speak of "traditional" Yoga does not mean doing anything on blind faith belief. The very heart of Yoga is based on personal experience. One is not to merely "believe" anything, but to explore within and discover for oneself that the principles, practices, and insights are valid. COMMUNITY and BELIEFS: Yoga is traditionally taught, practiced and learned through close relationships in a community of noble friends, known as kalyana-mitra. Guru is a stream of knowledge of direct experience which, though it may operate through a person, is itself not a person. While some participants in ashram activities have a theistic (god) orientation and others a non-theistic orientation, we virtually all intuit that there is only one, nondual (advaita), absolute reality even though it may appear to be dualistic. PURPOSE: Our purpose is to share with people who have an interest in the principles and practices of the Himalayan masters, including traditional Yoga Meditation, Vedanta, and internal, meditative (Samaya) Tantra (Yoga, Vedanta, Tantra). Our community of meditation and contemplation is devoted to serving those who deeply long for the direct experience of union with the eternal, pure center of consciousness, the bliss of being that is one with the absolute reality, as the wave who seeks to remember it is one with the ocean. One word for that union is "Yoga." THE HIGHEST ORIENTATION of our tradition is on Maha-tripura-sundari or simply Tripura. Maha is "great". Sundari is "beautiful. Tri is "three". Pura is "city/cities". Maha-tripura-sundari is thus meditation, contemplation, and devotion on that great, beautiful one consciousness that dwells in the three cities of waking, dreaming, and deep sleep. It is that which is the ground of, and which permeates the three levels or "cities" of the gross, subtle, and causal realities. It is also called Turiya, which means simply the "fourth" which is beyond, after, or the ground of the three (symbolized by the silence after the A, U, and M of Om Mantra). It is also called Mother, Divine Mother, or the feminine, as a metaphor of the consciousness that manifests out of the nondual reality. The active is called Shakti (feminine/creative) and the ground or latent is called Shiva (masculine/latent). In our tradition Shiva and Shakti are metaphors, not anthropomorphic beings, somewhat like many pieces of pottery (feminine/creative) manifesting out of clay (masculine/latent) or the many different meanings of words (feminine/creative) manifesting out of ink (masculine/latent). The entire universe is manifested through the outpouring of Shakti, which is actually one and the same with Shiva, with these, once again being metaphors, not deities. THE HUMAN BODY is the temple in which practices of meditation and contemplation are practiced. There is no external temple, church, synagogue, or mosque, etc. in which any worship is done, as all practices are internal. However, there is no objection to people practicing the religion of their choice, and a practitioner of our tradition may be comfortable in any setting, recognizing that all is a manifestation of that one, nondual (advaita) reality. 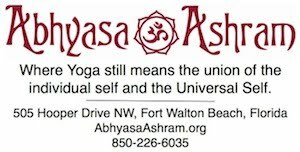 MEANING of ABHYASA and ASHRAM: The word "Abhyasa" means "practices." Abhyasa is purposefully choosing to do that which leads to "sthitau," which is a stable, steady, undisturbed inner calmness or tranquility. Abhyasa is one of the twin foundations of Yoga, along with Vairagya, the mental stance of non-attachment (Yoga Sutras 1.12-1.16). The root of the word Ashram is "shrama," which means "effort" or "striving." A meeting center, hermitage or home of a swami or other person serving people in their efforts towards inner peace and spiritual awakening may called an Ashram. Thus, our community of meditation, contemplation and learning is known as Abhyasa Ashram. More than any physical location it is really a place of the heart, an inner sanctuary of silence. MONASTERY: In common language, our ashram is most like a "monastary" or a "convent" as it is devoted to inner exploration through meditation and contemplation. It is not a business, studio, or seminar institution, etc. WE ARE A SMALL COMMUNITY: Our ashram is a small community of sincere and loving people, some of whom live locally in Florida, and many of whom live in other cities, states, and countries. If you would like to see what we're doing, please take a look at the calendar or contact us through the "Contact Us" button if you have questions. Take a look at our websites, which are linked just below. Stop by and visit for meditation for a few minutes of stillness and silence. May your meditations today bring you peace, happiness, and bliss. the greatest of all books and that is the very manuscript that you, yourself are." or to think that some guru is going to do it all for you. INVITATION: All sincere practitioners are welcome and invited, regardless of your level of practice of meditation and contemplation. However, Abhyasa Ashram is not a seminar or retreat business, as useful as such business can be, and therefore seeks no customers. Abhyasa Ashram is a private ashram and is mostly here to serve its members, guests and regular participants in their personal growth and inner exploration along the lines of the tradition of the Himalayan masters. To explore whether the orientation of the ashram matches your personal orientation, please read the following three articles, two of which are by Swami Jnaneshvara, and the other by Swami Rama, who is the direct teacher of Swami Jnaneshvara. Also included is the personal bio of Swami Jnaneshvara who is Founder, Chairman/President and Acharya (head teacher) of the ashram. All people who share these perspectives on the nature of traditional Yoga are sincerely and lovingly invited to join us in the journey to the realization of the union (Yoga) of the individual and the Universal. as communicated through the sage Swami Rama. in the conventional sense of the word. It means the *inner* school of self-study, of introspection into one's own true nature. As Swami Rama says in the quote below there are not any teachers constantly correcting you. emotionally, mentally, and spiritually intimate, rather than large theater-style classes. so that the deepest joyous level of our being can be experienced. “The great men like Christ, Krishna, Buddha, all these great men, they were like us. They were born exactly the way we were born. They walked on the Earth. They didn’t do anything unnatural. Nobody could see things with ears. No Bible on the Earth says you see through your nose when you become a great siddha or enlightened. What happens to you when you are enlightened? You see things as they are. Today you do not see things as they are. You don’t have the capacity to see things as they are. So, when you see that in the past, the history that explains about the great men, their deeds and achievements, they say that self-discipline can help one in attaining the goal of life. “What is the goal of life? If you do not know what the goal of life is, meditation, contemplation will be not useful. You should know what the goal of life is. You all say that the goal of life is to attain God. That’s not true. This is hearsay; you have heard it. You have read the book. Goal of life is not to attain God. Goal of life is to be free from all pains, miseries, and bondages. A state which is free from all pains, miseries, and bondages; that is the goal of life. To remain constantly in a state of happiness is the goal of life. To be happy and full of love is the goal of life. “It will become very easy for you to communicate with others, to understand others, to understand life and its counterpart, relationships, life and the other side of the coin, relationships. “You have to understand yourself, first step. Do you understand yourself? You see, you have a body; are you a body alone? A sage asks, he is going through dialogue, so he asks himself, ‘Who am ? Am I only a body? No, that’s not true.’ There is a dead body; that’s also a body. I am a breathing being too. But when you are in deep sleep and you have a body and you are a breathing being, are you being creative? No. You are a thinking being, but during that time your thinking is not brought into action. So, you are not only body, a breathing being, or thinking being; you are something beyond that. When you try to understand yourself, many mysteries are unfolded. The way you feel today, the way you understand things today, after knowing yourself, you’ll understand yourself in a different way. First attainment is freedom from fears, because then you’ll realize that unity, one absolute in all. It’s a great freedom.